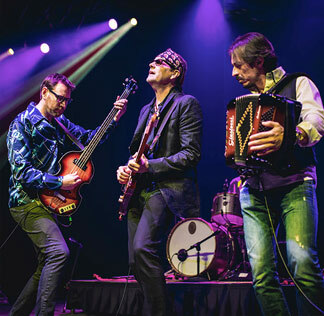 Those who have followed BoDeans’ remarkable 30-year musical career know that their blend of compelling songs and high energy performances have retained an unpretentious rock & roll loyal following like no other. One of the best live acts in the business, BoDeans tour year round, delivering amazing, high energy, performances. Best known for their catchy single, “Closer To Free,” the band’s accessible adult alternative sound has led to many a milestone, including a Rolling Stone Reader’s Poll forBest New American Band in 1987 for their smash hits "Fadeaway", "Only Love," and "Dreams," along with support slots with U2, Bob Dylan, Paul Simon, Tom Petty, George Thorogood, The Pretenders, David Bowie and numerous others. Appearances at Farm Aid, Summerfest, ACL Festival and others followed, along with TV appearances on “Saturday NightLive,” “Letterman,” “Today,” “Imus,” CNN, and ESPN to name a few.